The grammar of interrogative sentences (questions) can be confusing. Let's use sentence diagrams to better understand these sentences. Today's lesson is inspired by a question emailed to me from Robin. Robin was diagramming a sentence from the second chapter of the Sentence Diagramming Exercises when she thought of this question. 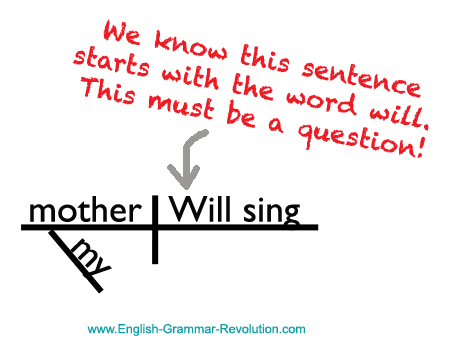 I was confused by the sentence diagram for the sentence, "Will my mother sing?" It was diagrammed with "will sing" together as the verb. It looks like it reads as, "My mother will sing." 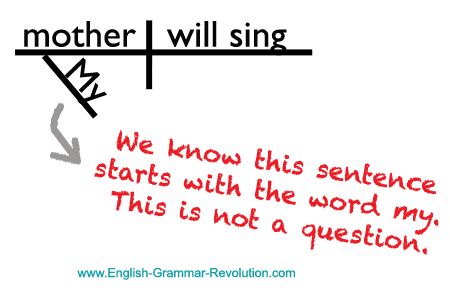 How can we show in the sentence diagram that this is a question and that "will" and "sing" are actually far apart? That's a good question, Robin. We need to review some background information about subjects, verbs, and sentences before I can answer it. Here we go! Subjects (Mary) tell us whom or what a sentence is about. Verbs (ran) tell us what the subject is being or doing. Many of our sentences begin with the subject and are followed by the verb. My sister voted for the best singer. Sentence diagrams separate the subject from the verb. The subject goes on the left side of the diagram, and the verb goes on the right side. Verbs can be single words or groups of words. When a group of words is acting as the verb, it is called a verb phrase. Verb phrases consist of one or more helping verbs (is, are, were...) and one main verb (run, grow, smile...). The helping verb(s) and the main verb come together to do the job of a single verb, so we diagram the whole verb phrase in the verb space of the sentence diagram. You should watch this movie! Interrogative sentences often contain verb phrases, and the helping verb(s) and the main verb are usually split up. Many times, the helping verb begins the sentence! Will you water the plants? These sentences may begin with helping verbs, but when we diagram them, we still have to diagram the subject on the left side and the verb on the right side. So, now it's time to answer Robin's question. How in the world can we show in the sentence diagram that the diagrammed sentence is a question? Have you figured out the answer by looking at the sentence diagram above? We show this by maintaining the capitalization of the original sentence! Notice that have in the sentence diagram above begins with a capital letter - just as it does when we write it out as a question. We all know that sentences need to begin with capital letters. By maintaining the original capitalization of the sentence, you know which word starts the sentence and you can figure out whether or not the sentence is a question. We know that the sentence in this diagram is a question because the word will begins with a capital letter. We know that the sentence in this diagram is not a question because the word will begins with a lowercase letter. Since my has a capital m, we know that it begins the sentence. There you have it. Now you know about the grammar of questions! I am amazed at all of your great resources. I'm now developing my sentence diagramming skills and learning how to use proper grammar. Your information is a big help for me as I teach my two lovely daughters at home. You've given me knowledge and confidence in myself! 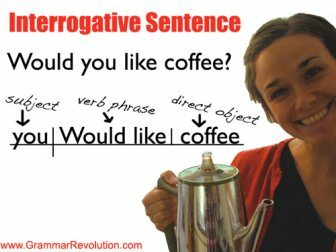 Go from Interrogative Sentences to English Grammar Revolution Home. Go back to Sentence Types.